Congress to AT&T: Where Are Those Jobs You Promised? What is AT&T doing with its massive profits from the Republican corporate tax cut bill? That's the question members of Congress are now asking. Last week, Reps. Mark Pocan (D-Wis.), Debbie Dingell (D-Mich.), and 23 colleagues sent a letter to AT&T CEO Randall Stephenson calling on the company to disclose plans for their profits from the tax bill – in particular on job growth. In addition, Senator Sherrod Brown (D-Ohio) led a group of U.S. Senators urging AT&T to settle on a fair contract with workers that protects and create jobs – as was promised by AT&T before the tax bill passed. "Since January 2016, AT&T alone has laid off thousands of call center workers and closed dozens of U.S. call centers," Brown's letter says. "We urge you to continue negotiating in good faith until an agreement is reached, and we urge you to include commitments in the contract that improve job security for your highly competitive workforce and reverse the trend of call center offshoring in our states." "The time is now for AT&T to follow through on its tax bill promises to create good, family-supporting U.S. jobs and invest in workers," said CWA District 4 Vice President Linda L. Hinton. "While AT&T stonewalls workers at the bargaining table over offshoring and outsourcing, the company is pulling in billions in profits from the tax bills. AT&T workers will not give up on their fight against layoffs, cuts, and closures." A coalition of labor unions including CWA is currently in national bargaining with the American Red Cross. 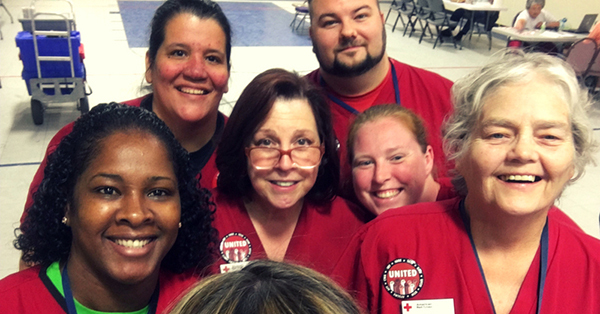 CWA represents Red Cross employees in Virginia, Pennsylvania, and New York. At the last national bargaining session in June, the Union Coalition presented ways to increase savings for the company and reinvest the savings into the workforce. Management, however, claims there is not enough money to provide workers a living wage and financial stability. The Union Coalition told management that workers will not make an agreement that takes workers backward on wages or healthcare. CWA members at the American Red Cross are mobilizing for a fair contract. After CWAers packed the State House to stop the New Jersey Legislature from shutting down the government and locking state workers out, legislators reached a last minute budget deal – including a CWA-supported millionaire's tax that will ensure the one percent pays their fair share. CWA members and supporters made thousands of phone calls and confronted legislators in their offices and in the State House hallways. For nearly two weeks, our union left no stone unturned in supporting Governor Phil Murphy's demand for sustainable revenue and a millionaire's tax. Throughout the budget process, CWA members sent a clear message to legislators that New Jersey needs sustainable, new revenue – not one-shots or cuts that balance the budget on the backs of public workers. CWAers worked with allies, especially the ATU and Better Choices Budget Coalition, alongside progressive women, clergy, and grassroots organizations to make it clear that protecting millionaires instead of education funding, public transportation, and pensions was not acceptable. As a result, New Jersey averted a shutdown and lockout of CWA members and passed a balanced budget that expands public services, public transportation, and public education, and provides for the largest payment ever to the underfunded pension system. After CWAers packed the State House to stop the New Jersey Legislature from shutting down the government and locking state workers out, legislators reached a last minute budget deal – including a CWA-supported millionaire's tax that will ensure the one percent pay their fair share. CWAers in Ohio, members of Locals 4302, 4320, and 4322, who gathered in Columbus in late April for a two-day CWA political boot camp training, have just completed a six-week follow-up political education and leadership development program designed to train activists on how to build working-class power. Participants worked on skills including member-to-member organizing in the workplace and communities, volunteer recruitment, creating organizing plans, and much more. Attendees also learned about the CWA Political Action Fund (PAF) and CWA's national legislative efforts to fight back against anti-worker legislation and advance bills at the state and federal level that protect call center jobs. The program gave members a chance to collaborate by sharing tips and best practices from their locals with each other. The training was paid for by CWA's Ohio Growth Fund. 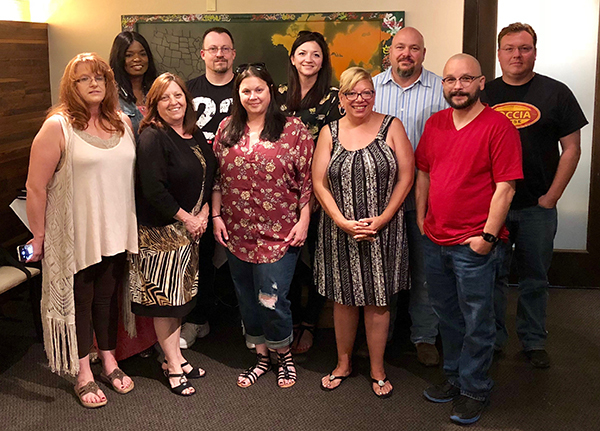 CWA members from several Ohio locals completed a CWA political education and leadership development program designed to train activists on how to build working-class power. Nearly two years after revelations of Wells Fargo's fraudulent account practices exposed predatory sales policies and abusive working conditions at the nation's biggest banks, a new report from the National Employment Law Project (NELP) and the Committee for Better Banks (CBB), a project of CWA, shows that little has changed — frontline workers are still facing high-pressure quotas, low pay, and few opportunities to advocate for better customer service. Despite public pledges by bank executives to eliminate sales quotes and fix a toxic workplace culture, more than half of frontline bank workers surveyed say they still depend on bonuses or incentive pay, and 90 percent of workers report facing consequences including bullying, retaliation, or possible termination if they fail to meet these metrics. "The banks promised things would be different, but the reality is bank workers like myself still face low pay, a toxic culture, and unclear metrics that aren't always aligned with the best interests of our customers," said Peggy Johnson, a member of the Committee for Better Banks and a customer service representative for Santander in Dallas. The report, based on a nationwide survey of 400 frontline workers employed by some of the largest banks in the country including Wells Fargo, US Bank, Bank of America, SunTrust, Citibank, Chase, and Santander, comes as Congress has rolled back bank regulations passed in the wake of the 2008 financial crisis and the Trump Administration continues to make it harder for the Consumer Financial Protection Bureau to advocate for Americans targeted by abusive big bank behavior. Corporate lobbyists and billionaire mega-donors have been gaining more and more power over our government at every level. To fight back and ensure that our voices are heard, we must build a democracy where everyone participates, every vote is counted, and voting rights are fully enforced. The By the People Resolution, introduced last week by Democracy Reform Task Force Chair Rep. John Sarbanes (D-Md.) and more than 160 U.S. House Democrats, lays out a set of proposals to restore balance to our political system so that it is no longer rigged in favor of the one percent. The resolution calls for expanding access to the ballot box, ending partisan gerrymandering, restoring the Voting Rights Act, ending the revolving door of special interests into and out of government, reasserting Congress’ authority to regulate political spending and overturn the Citizens United ruling, and much more. 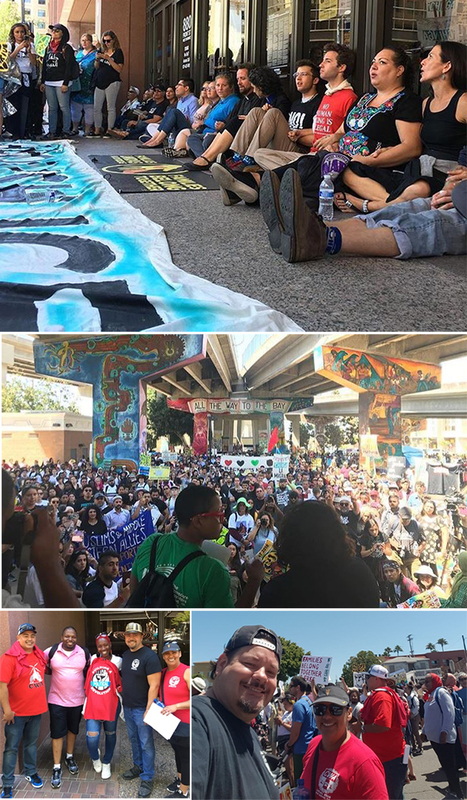 CWA activists joined IUPAT, MiJente, and other immigrant rights advocates to rally this week at Chicano Park in San Diego, Calif., to demand an end to the inhumane mistreatment of immigrant families at our borders, the immediate reunification of families, and a fair immigration system that protects all working people.